This post is sponsored by Grocery Outlet Inc. but the content and opinions expressed are my own. When I made my Creamy Pesto Shrimp Pasta recipe I realized how awesome the shrimp would be if served simply by themselves as an appetizer. 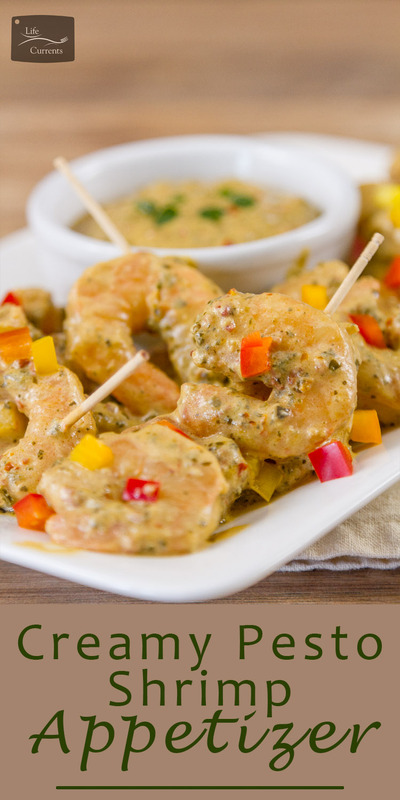 Just have a little extra creamy pest dipping sauce on the side and serve with some toothpicks or skewers, and you’re all set for a delicious and super easy appetizer that your guests will love! I really love the Grocery Outlet for all the fun food and adventures we have there. The selection always changes, so there’s always something new to discover. And they always have great brands and high quality foods. If you haven’t been to one yet, or you haven’t been in a while, it’s time to go! Find your local store on their store locator, and sign up for their WOW alerts via email while you’re on their website. And don’t forget to check out their wine section while you’re there so you can serve some amazing wines at your party! And you don’t have to tell your guests how much you saved on the wine by shopping at the Grocery Outlet. My Creamy Pesto Shrimp Appetizer is made with the super tasty Basil Dried Tomato Pesto that we found at Grocery Outlet. It’s so good that we bought extra containers and are going to be freezing a couple of the containers to save for later. Since the choice varies by store, your local Grocery Outlet may not carry this particular kind of pesto. That’s ok, this recipe will work with any kind of pesto, even homemade if you prefer to make your own. Place pesto, broth, and cream cheese in a medium saucepan, and cook over medium heat, stirring until cream cheese melts and the sauce is nice and smooth. Stir in defrosted shrimp to coat shrimp with the sauce. Place coated shrimp on a serving plate, and garnish with chopped pepper pieces. Place additional sauce in a bowl for dipping. Serve with toothpicks or skewers. That looks so decadent and yummy! I am a sucker for creamy dishes! YUM! I love recipes like this…I’m pretty much addicted to pesto! What a great shortcut for an easy appetizer! Easy, quick and delicious – looks perfect!! Never had the idea to cook shrimps that way for appetizers, nice way to using cream cheese! The basil dried tomato pesto sounds amazing! I am now on the hunt for it!